Scientists Don't Know Why We Crave Chocolate, But Who Cares? The LA Times says that scientists aren't really sure why even just looking at chocolate can improve your mood, or if cravings are more akin to drug cravings or simply improve your mood. Shall we test those theories? 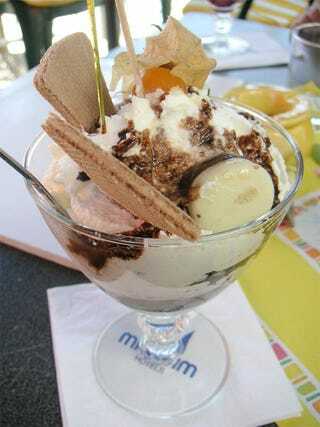 This is "Chocolate and vanilla ice cream with chocolate sauce, wafers and truffles." via orangebrompton on Flickr. Feel good yet? The spices of this firey, dark chocolate invigorate you as you anticipate the warmth of the chilies, the soothing essence of cinnamon, and the rich, intoxicating flavor of chocolate. As you indulge in this heavenly taste, remember chocolate is a natural high of stimulants and full of antioxidants. Enjoy yourself, the delightful vitamin "chocolate" is good for your body and your soul. "Chilies and Ceylon Cinnamon Chocolate" via ThePack on Flickr. "Herbi's Swiss Chocolate Cake" via norwichnuts on Flickr. "chocolate chiffon cake" via distopiandreamgirl on Flickr. A tiny dish of vanilla ice cream topped with a chocolate coated raspberry and paired with a chocolate mini tart filled with vanilla pastry cream and crowned with fresh raspberries and chocolate. Made with Wheeler's Black Label vegan ice cream. "Chocolate Raspberry Tart and Vanilla Ice Cream Dessert Plate" via QuintanaRoo on Flickr. "Chocolate Mousse with sponge and ganache icing [from] Ganache Chocolate" via avlxyz on Flickr. "chocolate-glazed doughnuts" via chotda on Flickr. dark chocolate ganache and chocolate cream on a chocolate shortbread crust. topped with a juicy strawberry. "chocolate ganache tartlet" via chotda on Flickr. "Chocolate Cherry Dessert" via feministjulie on Flickr. "chocolate bundt" via distopiandreamgirl on Flickr. "Whiskey Chocolate Brownies" via FotoosVanRobin on Flickr. "Chocolate coffee pie" via jessicafm on Flickr. "chocolate banana bread pudding" via stu_spivack on Flickr. "Chocolate labs and toffee cats" via selva on Flickr. "Chocolate-Covered Strawberries" via beautifulcataya on Flickr. "Dessert: Chocolate Souffle with Trio of Ice Creams" via ulterior epicure on Flickr. "chocolate walnut & fig torte" via distopiandreamgirl on Flickr. "Bittersweet Chocolate Shortcake" via Ciro Boro - photo on Flickr. dark chocolate and ginger brulee, white chocolate and thai basil brulee, and dark chocolate with chili pepper brulee. yum! "3 chocolate brulees" via chotda on Flickr. Filled with surprises (aka a chunk of bubbly chocolate or fruit & nut chocolate) topped with chocolate, peanut butter or coconut buttercream. "Chocolate Cupcakes" via Sifu Renka on Flickr.